Astronaut Story Musgrave (top right center) works with a restraint device near the Hubble Space Telescope during the first of five STS-61 EVAs. Servicing Mission 1, launched in December 1993, was the first opportunity to conduct planned maintenance on the telescope. In addition, new instruments were installed and the optics of the flaw in Hubble’s primary mirror was corrected. After Hubble’s deployment in 1990, scientist realized that the telescope’s primary mirror had a flaw called spherical aberration. The outer edge of the mirror was ground too flat by a depth of 2.2 microns (roughly equal to one-fiftieth the thickness of a human hair). This aberration resulted in images that were fuzzy because some of the light from the objects being studied was being scattered. COSTAR (the Corrective Optics Space Telescope Axial Replacement) was developed as an effective means of countering the effects of the flawed shape of the mirror. COSTAR was a telephone booth-sized instrument which placed 5 pairs of corrective mirrors, some as small as a nickel coin, in front of the Faint Object Camera, the Faint Object Spectrograph and the Goddard High Resolution Spectrograph. The new Wide Field Planetary Camera (WFPC2) significantly improved ultraviolet performance over WFPC1, the original instrument. In addition to having more advanced detectors and more stringent contamination control, it also incorporated built-in corrective optics. In addition, SM1 included the installation and replacement of other components including the solar arrays, Solar Array Drive Electronics (SADE), magnetometers, coprocessors for the flight computer, two rate sensor units, two gyroscope electronic control units, and GHRS redundancy kit. 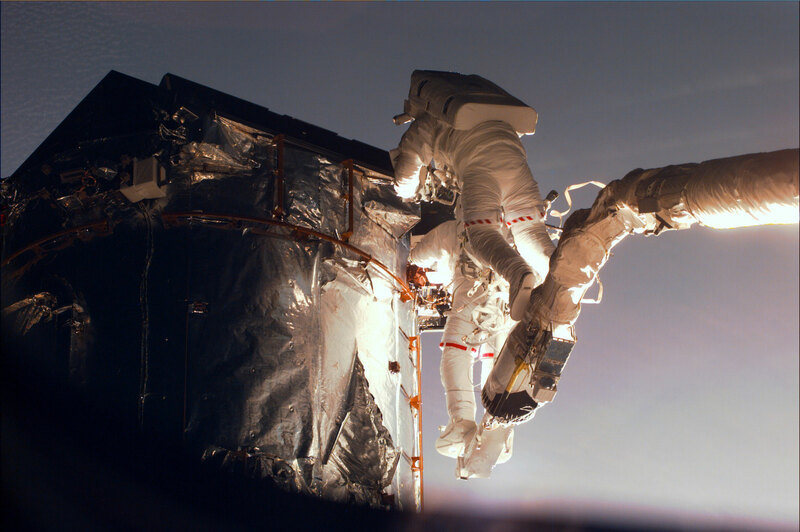 The Second Servicing Mission, launched February 11, 1997, greatly improved Hubble’s productivity. The installation of new instruments extended Hubble’s wavelength range into the near infrared for imaging and spectroscopy, allowing us to probe the most distant reaches of the universe. The replacement of failed or degraded components increased efficiency and performance. The Space Telescope Imaging Spectrograph (STIS) provides Hubble with unique and powerful spectroscopic capabilities. A spectrograph separates the light gathered by the telescope into its spectral components so that the composition, temperature, motion, and other chemical and physical properties can be analyzed. STIS’s two-dimensional detectors have allowed the instrument to gather 30 times more spectral data and 500 times more spatial data than the previous spectrographs. One of the greatest advantages to using STIS is in the study of supermassive black holes. STIS searches for massive black holes by studying the star and gas dynamics around galactic centers. It measures the distribution of matter in the universe by studying quasar absorption lines. It also uses its high sensitivity and spatial resolution to study star formation in distant galaxies and perform spectroscopic mapping of solar system objects. The Near Infrared Camera and Multi-Object Spectrometer (NICMOS) has let us gain valuable new information on the dusty centers of galaxies and the formation of stars and planets. NICMOS consists of three cameras. It is capable of both infrared imaging and spectroscopic observations of astronomical targets. NICMOS gave astronomers their first clear view of the universe at near-infrared wavelengths between 0.8 and 2.5 micrometers – longer wavelengths than the human eye can see. (The expansion of the universe shifts the light from very distant objects toward longer red and infrared wavelengths.) NICMOS’s near infrared capabilities have provided views of objects too distant for research by previous optical and ultraviolet instruments. A refurbished Fine Guidance Sensor (FGS) was installed. Hubble uses this optical sensor provide pointing information for the spacecraft and as a scientific instrument for astrometric science. The modification to this FGS spare added the capability for ground-controlled alignment corrections. The addition of an Optical Control Electronics Enhancement Kit. The OCE-EK provided the electronic pathway for commanding the alignment mechanisms. The Solid State Recorder (SSR) replaced one of Hubble’s three Engineering Science Tape Recorders (ESTR). The SSR provides much more flexibility than an ESTR, which is a reel-to-reel recorder and can store ten times more data. One of the other ESTRs was also replaced, but with a spare ESTR unit. During SM3A mission the reel-to-reel units were replaced with solid state recorders. One of Hubble’s four Reaction Wheel Assemblies was replaced by a refurbished spare. The RWA is part of Hubble’s Pointing Control System. Spin momentum in the wheels moves the telescope to a target and maintains it in a stable position. Four Data Interface Units (DIU) on Hubble provide command and data interfaces between the spacecraft’s data management system and the other HST subsystems. DIU-2 was replaced with a spare unit that has been modified and upgraded to correct for failures that occurred in the original unit. The Solar Array Drive Electronics (SADE) controls the positioning of the solar arrays. Hubble has two SADEs of which one was replaced during the first servicing mission. The unit that was returned from orbit has been refurbished to correct for problems that resulted in transistor failures and was used to replace the second unit. The Hubble Space Telescope is alive and well and back on duty after a successful servicing mission in December 1999. (SM3A). To prove it, NASA released two stunning images taken by Hubble just two weeks after Discovery’s Christmas-time service call. 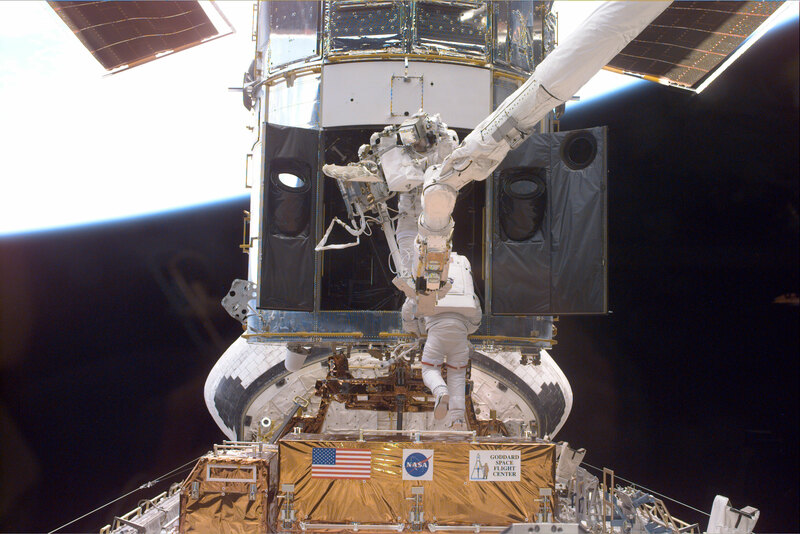 Discovery’s seven-member crew included two Hubble Servicing Mission veterans. Launch of STS-103 What was originally conceived as a mission of preventive maintenance turned more urgent on November 13, 1999, when the fourth of six gyros failed and Hubble temporarily closed its eyes on the universe. Unable to conduct science without three working gyros, Hubble entered a state of dormancy called safe mode. Essentially, Hubble “went to sleep” while it waited for help. NASA decided to split the Third Servicing Mission (SM3) into two parts, SM3A and SM3B, after the third of Hubble’s six gyroscopes failed. In accordance with NASA’s flight rules, a “call-up” mission was quickly approved and developed and executed in a record seven months. Release of Hubble back into orbit The Hubble team has left the telescope far more fit and capable than ever before. The new, improved, and upgraded equipment included six fresh gyroscopes, six battery voltage/temperature improvement kits, a faster, more powerful, main computer, a next-generation solid state data recorder, a new transmitter, an enhanced fine guidance sensor, and new insulation. 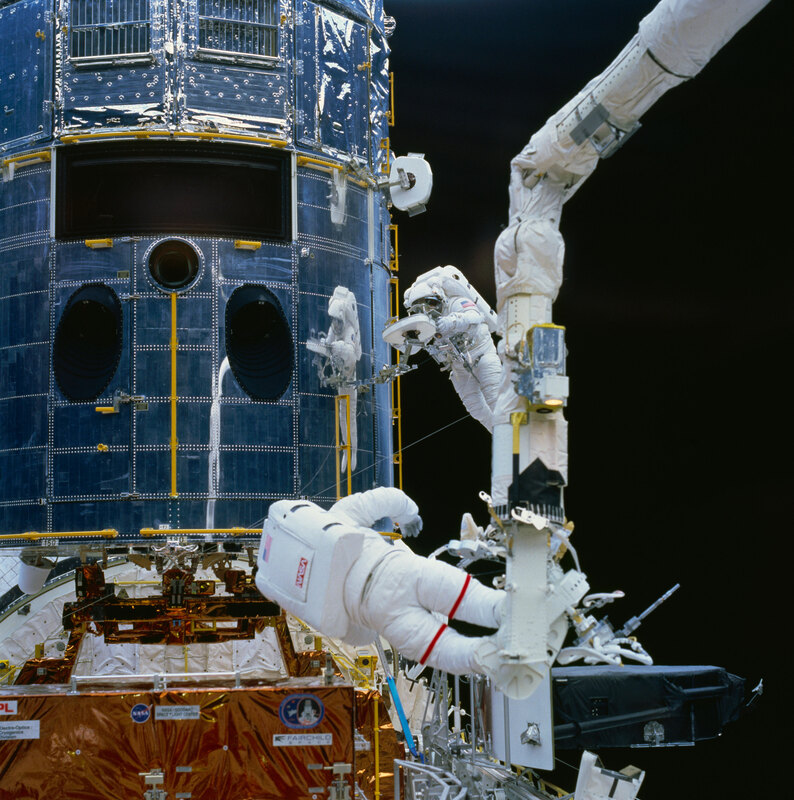 Servicing Mission 3B was actually the fourth visit to Hubble. NASA split the original Servicing Mission 3 into two parts and conducted 3A in December of 1999. During SM3B a new science instrument was installed: the Advanced Camera for Surveys (ACS). Several other activities were accomplished as well over a 12-day mission with five spacewalks. With its wide field of view, superb image quality, and exquisite sensitivity, Hubble’s newest science instrument, the Advanced Camera for Surveys (ACS) has 10 times more discovery power than the camera it replaces. In other words, ACS can produce 10 times as many science results in the same amount of time. Four large flexible solar array (SA) panels (wings) provide power to the observatory. 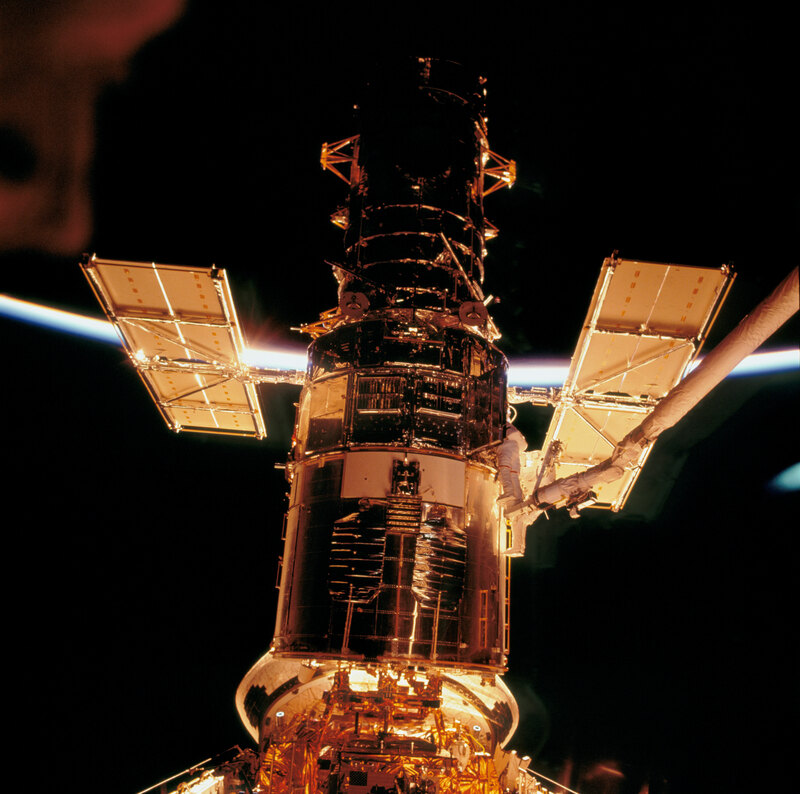 During SM1, the original arrays were replaced by SA2 and have powered Hubble for over eight years. Radiation and debris have taken their toll on sensitive electronics, which were replaced to ensure uninterrupted service for the remainder of the mission. The new solar arrays (SA3) are rigid arrays, which do not roll up and therefore are more robust. Hubble got a brand new look with its latest set of solar wings. Although one-third smaller than the first two pairs, the power increase was between 20 and 30 percent. They are less susceptible to extreme temperatures and their smaller-sized will reduce the effects of atmospheric drag on the spacecraft. As Hubble’s power switching station, the PCU controls and distributes electricity from the solar arrays and batteries to other parts of the telescope. Replacing the original PCU, which had been on the job for 11 years, required Hubble to be completely powered down for the first time since its launch in 1990. Hubble’s new PCU has allowed astronomers to take full advantage of extra power generated by the new solar arrays. Astronauts retrofitted an existing but dormant instrument called the Near Infrared Camera and Multi-Object Spectrometer (NICMOS) with a new, experimental cooling system to return it to active duty. NICMOS was placed on Hubble in 1997 but became inactive two years later, after depleting the ice it needed to cool its infrared detectors. By fitting NICMOS with the experimental cryogenic system, NASA was able to re-cool the detectors to -334°F (-203°C or 70 K) to revive its infrared vision. The super-quiet cooler uses ultra-high speed microturbines, the fastest of which spins at over 200,000 rpm (over 50 times the maximum speed of a typical car engine). Hubble’s engineering team successfully demonstrated this technology in 1998 aboard STS-95 in the first on-orbit test of a high-performance, high-efficiency, mechanical cryocooler.